You know those stupid novelty signs that say things like “Mustang Parking Only” that dorks like to put in their garages? They’re harmless fun, right? Of course they are. But you know, you could make them a whole lot less harmless if you replaced handicapped spots with signs like that, in exchange for money from one particular car brand. You know, like the Calgary Airport recently did with Lexus. 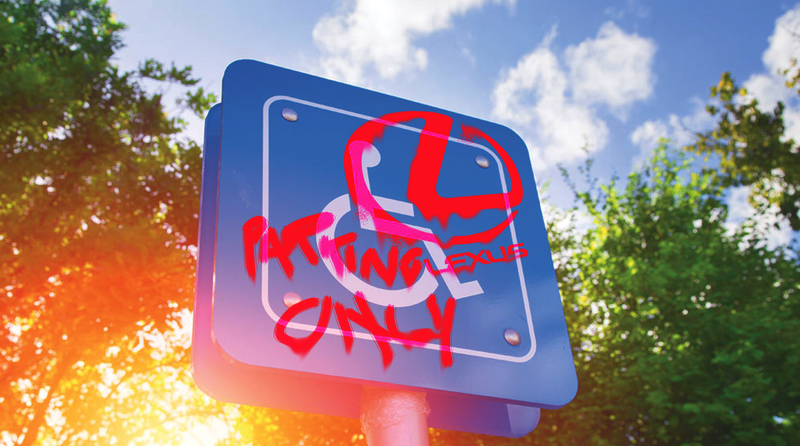 Yep, that’s right, the Calgary Airport Authority in Alberta, Canada turned five ‘accessible’ parking spaces (analogous to American Handicapped Parking) into Lexus-branded parking spaces reserved only for those handicapped with Lexus ownership. I kid! Lexuses are great. Great cars. I’m not kidding about the parking spaces, but after the fecalstorm that followed when a family with access needs found their spaces gone/occupied by gleaming Lexii, I bet the Calgary Airport wishes they were kidding. The Calgary Airport Authority spokesperson did remind everyone that “We’re always looking at different ways to diversify our revenue stream,”which is, you know, great for them, but how the hell did they think this was going to play out? If there’s a way to spin “airport removes access for disabled people in order to make money” into a positive, I sure as hell don’t know how to do it. The airport’s reasoning is like the motivation for every rich ‘80s ski-movie villain who ends up getting pushed into a swimming pool at the end of the movie. It’s all been made right again, so that’s good, but be sure to spare a thought for the real victims here: Lexus owners, doomed to have to park alongside all those miserable, unwashed Sentras and rusting Econolines, like filthy animals.